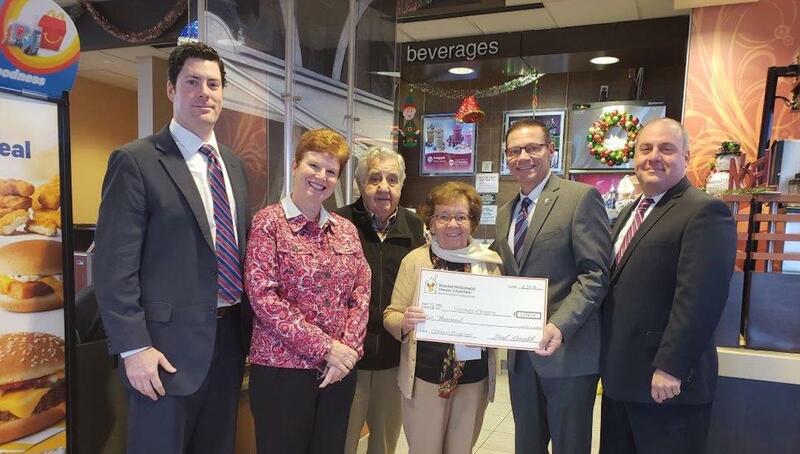 Ronald McDonald Children’s Charity presented a check to The University of Scranton in the amount of $5,000 to support the community playground at the University’s Rev. Kevin P. Quinn, S.J., Athletics Campus. From left: Eric Eckenrode, interim executive director of development at the University, Meg Hambrose, director of corporate and foundation relations at the University; Albert Mueller, board member of Ronald McDonalds Children’s Charities; Carol Mueller McDonald’s owner operator; David Martin, athletics director at the University; and Fred Rinaldi, Esq., board president of Ronald McDonald Children’s Charity. Ronald McDonald Children’s Charity presented a check to The University of Scranton in the amount of $5,000 to support the community playground at the University’s Rev. Kevin P. Quinn, S.J., Athletics Campus. The 2,580 square-foot play area, which includes sliding boards, a bridge, swings, ladders, climbers and a sliding pole, is part of an 11-acre athletics campus located along Broadway Street in Scranton. The Quinn Athletics Campus, dedicated in May of 2018, also includes NCAA regulation baseball and softball fields, a multipurpose field that meets NCAA standards for soccer, lacrosse and field hockey, bleacher seating at each field, a field house and a community basketball court. The University’s soccer, lacrosse, field hockey, baseball and softball Division III NCAA teams play at the campus.